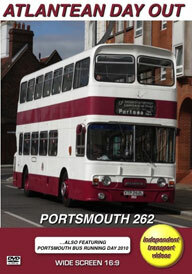 The City of Portsmouth Passenger Transport Department operated a large fleet of Leyland Atlanteans. The first ones entered service in 1962 and the final batch was delivered in 1975. One such vehicle from the 1972 batch is 262 (VTP 262L), an AN68/1R type with an Alexander H75D body. Thankfully now preserved and in the current ownership of Darren Marshall. It was decided that on Saturday 26th March 2015 262 would take a tour of a number of former ‘Corporation’ routes. A ‘running board’ was drawn up by fellow enthusiast Peter J. Clark and 262 took to the road with a number of friends and enthusiasts on board, including the independent transport videos cameras! Our day out began at Hilsea, just opposite the former Southdown Hilsea depot site, now luxury apartments appropriately named ‘Southdown Views’. The first journey was service 2, which runs to Paulsgrove via Cosham. Filming was taken from various parts of the bus, taking in the sounds of the Leyland 0.680 engine and views from the windows that would have been commonplace for the passenger in the 1970s and early 1980s. We also have a number of ‘drive-by’ sequences for you to enjoy as we take our nostalgic journey. The day continued with the bus visiting locations such as Cosham, Southsea, the city centre and The Hard, the latter was known as ‘Dockyard’ on the destination screens of Portsmouth buses in the past. The Hard has a bus interchange which is about to be redeveloped putting the buses back on the streets as it was in days gone by. Our cameras also captured the current buses now operated by Stagecoach and Firstbus with both companies running high frequency services using virtually all brand new buses. These are mainly single-deckers. There are some new Enviro 400 double-deckers operated by Firstbus on the park & ride service giving a nice comparison against our 1972 Leyland Atlantean. Further locations on our day out include Hayling Ferry, Clarence Pier, Broad Street and then out to the outlying massive Leigh Park estate before returning to Hilsea at the end of a most enjoyable day. We have included the ‘running board’ to assist you with the locations, routes and timings. We would also like to thank Darren and Peter for making the day possible. The second part of our Portsmouth programme is some cine film from the camera of Richard Newman of the superb Leyland Titan TD4s that Portsmouth ran as open toppers throughout the 1960s. The four buses had English Electric O50R bodies and date from 1935. You will see that one of the locations Richard filmed them at was Hayling Ferry, the same location where we filmed 262 some 47 years later! The third and final part of our Portsmouth buses programme was filmed on the 11th July 2010 at the Portsmouth Buses Running Day. Here we see preserved Portsmouth buses, including Leyland Atlantean 236 (BBK 236B), from the 1964 batch, single-deck Atlantean 190 (TBK 190K) and 5 (RV 6358) one of the 1935 TD4s operating along the Esplanade at Southsea and in the streets of Old Portsmouth. We hope you enjoy this journey back in time, sampling the delights of former Portsmouth buses.